Club Penguin Wiki:Party Ratings/2014/Pirate Party - Club Penguin Wiki - the free, editable encyclopedia about Club Penguin's games, rooms, items and parties! You are on the party reviews page for the Pirate Party 2014. Ratings for this even are now closed. However, you are free to join us on our wiki chat by clicking here! Club Penguin,This party was very creative, I Love The Fight With The Crabs, And The Rooms,WHOAH! The rooms were OK, but I still think they should've decorated the top part of the island instead of only the bottom half. I could see lots of potential with the rooms inside the Town and Plaza, such as the Pizza parlor, Night Club, Coffee Shop, etc. The quests are a bit boring a repetitive as all you do is fight crabs, and there's no way you can lose as all you do is press a button. Overall, I give the party a 2 out of 5 as there's not much you can really do and there's very little rooms. I'd like a EPF operation+Card Jitsu Shadow, and I'd like found Herbert, but the party s Ok.
And this is my opinion, but my English isn't too good. There could have been more rooms decorated at the Pirate Party. Six rooms decorated seems too little. Most rooms don't even look like their original design and shape; although they looked quite nice, it's hard to class them as 'decorations'. Nothing really matched, if you went to the town it's decorated and then when you go into, for example, the Coffee Shop it's not got the same barrel shape as the exterior and still has a big rectangular window even though there isn't one on the outside. The items all look okay, they all fit the theme of the party well and non-members get alot, although they could only get one of the five swords. I don't get why we could get up to 50 free puffle hats when only the normal non-creature puffles can wear them. The sword fighting with the three crabs was okay, Club Penguin could have designed the battle room differently though instead of editing and using the beach igloo background. The battle did (on some occurrences) have a few glitches and was quite repetitive. It was nice to see a duel like the one from the Star Wars Takeover return, it was fun to battle with other players and earn coins. However, it did get quite boring after a while. Like the crab Battle, there was a few bugs with the duel (on some occurrences) and it did become quite repetitive. The Pirate Party lacked replay value, why keep dueling if you don't get any more coins or items because you've got them all? You could only battle the crabs once a day, why couldn't we have been able to battle the crabs again or battle a few in one room and then once we're done we can move onto the next room to battle more? The music for the party was nice, the tracks fit the theme of the party. It was nice to see Rockhopper return for the party, we hadn't seen him in a while. The storyline for the Pirate Party was decent, Rockhopper tells a group of pirate crabs about Club Penguin on Swashbuckler Trading Post, they like what they hear, board his ship, take it over and end up at the island. It would have been nice to hear the Pirate Crabs side of the story instead of just Rockhopper and the CP Times basically saying "the crabs are bad". What about Herbert? His website was updated to show robotic crab blueprints and a periscope. Why didn't he show up? Klutzy could have been involved seen as though he's a crab. The party emotes are quite nice and fit with the theme of the party. Overall, I think the Pirate Party 2014 was okay, I wouldn't say it is 2014s best party as the team could have decorated just a few more rooms and made it so the crab battle and player duels weren't as repetitive and lacking in replay value. I'm going to rate this event a 2.5/5. I was all hyped for nothing, I wanted to see what new items there would be in the Migrator, except we can't even go there! The items are very well made, and are pretty cool. The rooms are good, if only more would decorated. The duels were great. The worst problem is, we can't go on the X, so the Town had a lack of space to walk around, so as a few other rooms. I found it hard to connect with the storyline, which saw crabs pester and steal from Rockhopper's ship, causing the eventual sinking of the Migrator. That plot device had several weaknesses. First, the telescope could only show one glimpse of the crabs doing just that, completely omitting the progressive element of the storyline. This was way less effective than the telescope scene in 2008 where we could see the "full sequence" of the Migrator sinking. Secondly, just after Club Penguin's weak villain, Skip, who only served as a villain to the Halloween Party because he was a ghost, we get the pirate crabs. I wouldn't be surprised if the pirate crabs were used just because they have the claws to screw Rockhopper's ship. It is definite though, that the pirate crabs were uncommunicative, that it was difficult to have an ambition to go against their evil motives. We don't have any backstory to why the pirate crabs stole from Rockhopper because of the pirate crabs' lack of characterization or dialogue. Maybe they are just an excuse to bring about the renovation of Rockhopper's ship? It's a shame that no villain to Club Penguin has achieved the mastery of Herbert, and yet he fails a lot. Also, prior to the party, we get the weak plot device of a week's old message arriving. This was simply an information dump to foreshadow the plot. 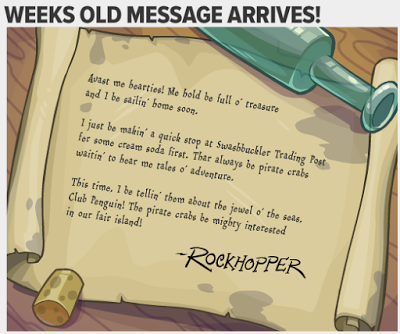 It's questionable whether Rockhopper genuinely wanted to send such a message. It's not like we were expecting him in November anyway. The sinking of the Migrator was very undramatic - in fact, so undramatic that the shipwreck is unrealistically static in the sea (as viewed from the Beach). The pirate crabs that "invaded" the island only came in groups of 3 for each room - kind of a weak invasion if you ask me. If the pirate crabs actually dominated the island and swarmed around the place, then the party would be less forgettable. So apparently the southern area of the island gets redecorated into an island characteristic of an island a pirate would enter. But that makes no sense since the decoration is only there for display. Nonetheless, I did enjoy the visuals of the Forest and the Cove, which employed a lush combination of natural colors, highlights, scenic focus, and roleplay opportunities. They weren't perfect though. The Cove, for example, could have let water overlay the player when in the water instead of looking like we could walk over it as if we were walking on water. The other rooms however, carried the same theme of over-decoration as the Halloween Party 2014 showed, especially considering that the interiors of the decorated buildings weren't decorated at all. The Dock was especially cramped, and there was no reason to have the Hydro-Hopper as a ship if you can't even play it as a ship in-game. Also, how did the sea color somehow become more greenish? Rockhopper hardly plays a believable character in this party. His ship has sunken yet he seems unmoved by this in his appearances on Club Penguin other than calling it a "tragedy". Hardly do we ever get to help Rockhopper's hidden dismay other than doing what he tells us, which is the "standard role of battling the crabs for loot". We don't get much of a emotional connection with Rockhopper that it seems we are being demanded a favor from him rather than helping him as a protagonist. I disliked how Rockhopper had dialogue moments which weren't in-game. If you did the wrong move in a crab boss battle, he'd give you constructive criticism through watchful commentary, but not actually join in the battle himself. Talk about lame. Nonetheless, I praise Rockhopper's cunning plan to lure the pirate crabs out of the island. The items available at the party were a mixed bag. They might not be that appealing in general because of their stereotypical pirate-like nature - but they can come in handy. Alas, the incentive to obtain these items in the party is still by the unfortunate long-running cliché formula. Chillin43 sums this point up: "We've seen the 'come back each day for a new challenge in another room that will take at most thirty seconds and won't offer any sort of stimulation or enjoyment and we'll give non-members a new free item and members a new free item' before." I did appreciate a selection of the items in the Furniture & Igloo Catalog and the Penguin Style. Seeing an underwater igloo location and pirate ship furniture in particular was a delight and a promise for further creativity. The Crab Battles were initially interesting, but these got repetitive and uncreative fast. Like I said before, the duels is based on chance. Also, the crabs just attack you one by one. Can't they think a little more smarter than that? If this was more fun, we wouldn't have to be needing item incentives for these battles in the first place. Like Green N Cool said, "why keep dueling if you don't get any more coins or items because you've got them all?" Ninja Penguins pointed out that "we can't even go" to the Migrator. This is a good point as exploring the Migrator shipwreck would've made gameplay more memorable. He also commented on the restrictions of exploration, "The worst problem is, we can't go on the X, so the Town had a lack of space to walk around, so as a few other rooms". If we had more freedom, like we did in Rockhopper's Quest where we could go to islands beyond Club Penguin's boundaries, I'd guarantee that the Pirate Party 2014 would've had more replay value. I couldn't say this any better than Chillin43 did: "The music at this party is fine. None of it is very memorable, but none of it is bad. The same can be said for the items. Do you sense a theme here?" The Pirate Party 2014 had a bland delivery. I guess overall the decorations and items were the only highlights, but everything else was not impressive at all. There was not enough for the party to reach a satisfactory level. 4.5 out of 10. This page was last modified on 18 December 2014, at 03:09.